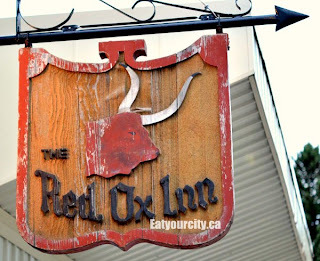 Been heading to Red Ox Inn for the last several years and its a rare gem as its consistently consistent with its excellent food -Unassumingly and simply prepared, beautiful plating, innovative and complex tasting profiles that meld to lift this cozy intimate restaurant (only has about 10tables and seats about 40ppl max) into the list where truly special occasions can and should be held. Bonus points for locally sourcing ingredients. Service is always polite and helpful, especially in the wine deciding section. Over the years some of the appetizer sizes have shrunk in size (the crabcakes and scallops - very much lamented as they are very tasty and executed well) and the sides have evolved and changed up/swapped to enliven the menu. The crispy crabcakes (with mainly crabmeat) are now served in a strange yogurty-fruit sauce.. the old roasted jalapeno sauce paired much much better, but thankfully the giant shrimp appetizer is still the same. Can never go wrong with giant seasoned seared shrimp in my books. The duck, lamb and steak have always been made to perfection, and need no other descriptions, because you just need to put it in your mouth, sit back and enjoy. Desserts if you have room are made in house - the bread pudding is a mainstay as is the fresh lemon tart/flan. I always regret not licking the fresh vanilla and creme carmel sauce that came with the bread pudding off my plate... the pudding was just an excuse to have that delectable sauce... nomnomnom! Quibble - sometimes "too creative" taste profiles in sides or sauces detract from the dishes, 8.5/10. Wonderful food, service and almost most importantly of all - they are consistently so! Only drawback, this little gem has become so popular it gets difficult to get reservations and can get extremely loud in the small compact space (especially when other tables may be having a glass or ten too many), so when you go, call well in advance for a table. Head here for a full review with pics! Just recently went there for my fiance's birthday dinner and service was far from attentive! Food was good but service was lacking especially coming from a fine dining restaurant. I asked for a candle on his dessert which was completely ignored. Food was good but not enough for me to return.